On this day in 1944 the Grumman F8F Bearcat made its first flight. Work on the F8F Bearcat began in 1943 after a meeting between F4F Wildcat pilots and the Vice President of Grumman. During this meeting, it was emphasized that the most important requirement for a good fighter was climb rate. The F8F was designed to operate from the smallest aircraft carriers in an interceptor role and to accomplish this the range of the aircraft was sacrificed, but in return for that the aircraft had a climb rate that was 30% faster than its predecessor (the F6F Hellcat) and was also 50 mph faster. The first F8F prototypes were ordered in November, 1943, and first flew just nine months later. The first production models were delivered in February, 1945, and was operational with Fighter Squadron 19 (VF-19 “Satan’s Kittens”) on May 21, 1945 but World War II was over before the aircraft saw combat. The Bearcat served with the US Navy and the USMC, as well as the air forces of other nations, until the mid-20th century. It also served as the demonstration aircraft with the US Navy Blue Angels from 1946 until 1949. A total of 1,265 Bearcats were built, with a number still airworthy and owned by private individuals. 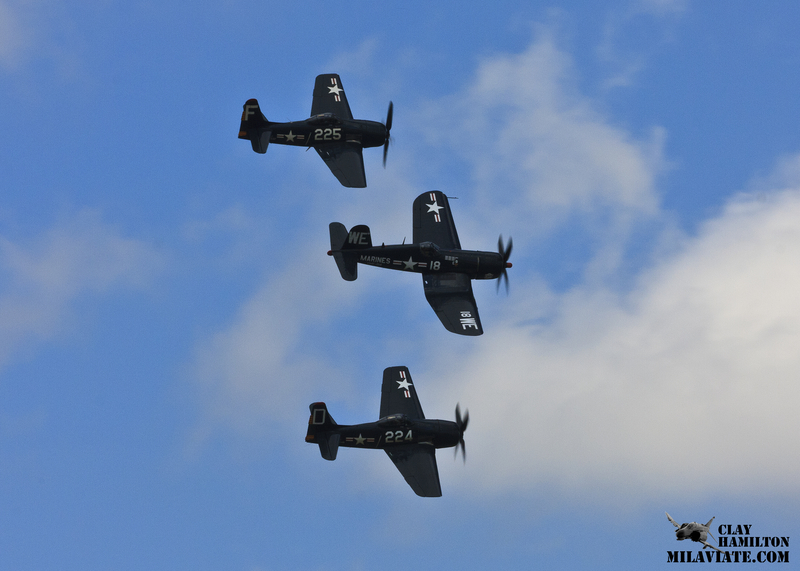 The Horsemen perform in an F4U Corsair and two F8F Bearcats at the NAS Oceana Airshow in September, 2010. Photo by Clay Hamilton.